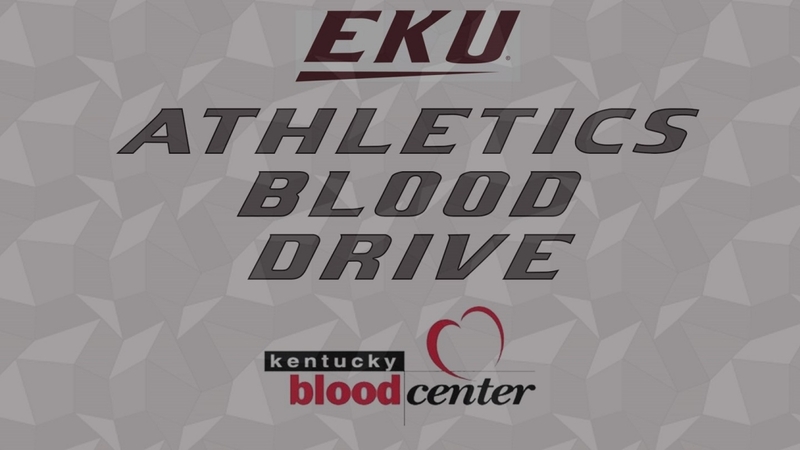 EKU athletics is pairing up with the Kentucky Blood Center to host a blood drive on Wednesday, Feb. 7 in the Auxiliary Gym on the second floor of Alumni Coliseum. RICHMOND, Ky. – Eastern Kentucky University athletics is pairing up with the Kentucky Blood Center to host a blood drive on Wednesday, Feb. 7 from 10 a.m. to 4:30 p.m. in the Auxiliary Gym on the second floor of Alumni Coliseum. "We are excited to partner with the Kentucky Blood Center again to make a small impact on their donations," Athletic Academic Advisor/Life Skills Coordinator Josh Shipp stated. "Our athletes, coaches and staff value the opportunity to give back to our community especially when it means having the chance to save a life like this partnership allows."